Unified Fine (UNF) and Unified Coarse (UNC). American threads consist of two common and easily obtained thread patterns known as U. N.F and U.N.C. U.N.F [national fine] is exactly the same as the old S.A.E [standard american engineers] that existed before threads were unified. U.N.C [national coarse] roughly derived from the British Whitworth have the same pitches except 1/2 in dia where Whitworth is 12tpi and U.N.C is 13 tpi. 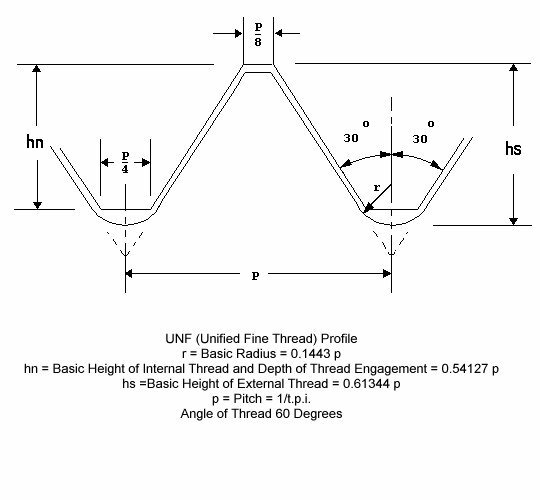 5/16 and 3/8 UNF are both 24tpi but 1/4 UNF is 28 tpi and a special 1/4 x 24 thread must be used. 7/32 x 24 UNC is an obsolete thread. In the late 1960's, when even the U.S. was thinking of going metric, the giant BSA corporation decided it was finally time to scrap the 19th Century Whitworth-based system, and switch to American. Since they had lots of money invested in tooling, the switch wasn't made suddenly (or completely), so bikes and cars from the late '60's and later had a mix of all sorts of thread forms. Typically, engine internals (e.g. the thread on the end of a camshaft) stayed with whatever form it used to have, while simple fasteners (e.g. holding the mud guards on) switched to UNF.